Every now and then (actually on a weekly basis), I come across a “Holy Cow!” work of art in our image collection that I either never noticed before or had not seen in a really long time. Usually, because I’m a painter, I get blown away by brilliant color in paintings. This week, it happened to me when I came across this church while researching something else. I’m sure when I mention the word “church” many of you think of Gothic cathedrals like Notre-Dame in Paris or the cathedral at Chartres (in every art history book). The church architecture that I find a lot more interesting is that of the 20th and 21st centuries. Now, when I mention the style “Expressionism,” do you immediately think of painting or sculpture? Well, the style is also defined in architecture. Challenge your students to think of contemporary (21st century) buildings that could fit the stylistic definition Expressionism. Experimental architecture in northern Europe between 1900 and 1933 derived great impetus from German architects who worked consciously on establishing a “school” or modern architecture, devoid of the romantic historicism that dominated nineteenth-century architecture. Interestingly, this was the period of the flowering of the “Chicago School” of architecture in America that pioneered the skyscraper. Expressionism manifested itself in architecture, although it did not constitute a large number of buildings. It was stamped out by the Nazis as “degenerate,” but it established a base for a movement in architecture later realized in the 1950s and 1960s as well as the 1980s under Postmodernism. The first evidence of the expressionist attitude was the idea of monumentality projected by a building. In other words, the building has the appearance of sculpture. 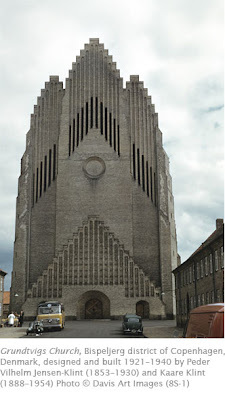 While some buildings relied on dramatic organic curves in their facades, others, like the Grundtvigs Church employed jagged line seen in German expressionist painting. Brutalism, an offshoot of the International Style, popular from the 1940s to the 1970s, was greatly influenced by trends in expressionist architecture. Peder Jensen-Klint was a Danish painter, engineer, and architect. His aesthetic goal was to merge classical forms of architecture with modernism, much as was the emphasis of the Bauhaus in Germany. Grundtvigs Church has the soaring vertical emphasis of traditional Gothic cathedrals, and their traditional three-aisle hall interior. But, it uses the traditional stepped gable of traditional Danish churches to form a dramatic angularity on the façade that gives it an expressionistic silhouette. The yellow brick construction (some six million of them) is also a traditional feature of Danish church architecture. This website contains some awesome views of the church. Expressionists are certainly inspiring especially when it comes to architecture. Some buildings are just fascinating by their structure and the front appearance is amazing.